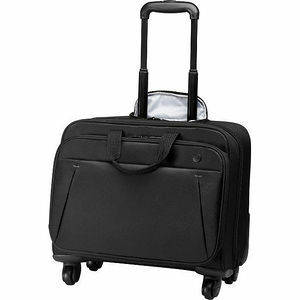 Speed through your day, in the office, on the road, and in the air with the HP 17.3 Business Roller Case, a notebook case with a retractable handle and four rolling wheels. Help keep your notebook up to 17.3" diagonal and personal items safe with lockable zippers and a secure RFID pocket. Use the adjustable retractable handle to find your comfortable height, and enjoy effortless vertical rolling with four wheels that allow you to walk with the bag alongside, in front of or behind you.